Alt text: "Remember, meteors always hit the tallest object around." Tettigoniids: may be distinguished from grasshoppers by the length of their filamentous antennae. Last edited by sbkp on Fri Aug 09, 2013 7:58 am UTC, edited 1 time in total. In astronomy, you spend half the time waiting for things, and the other half coming up with names for them. I didn't know meteor showers have names (assuming that's true) but I deduce that exactly none of the notes are the slightest bit serious. As for the names themselves, I have no idea. 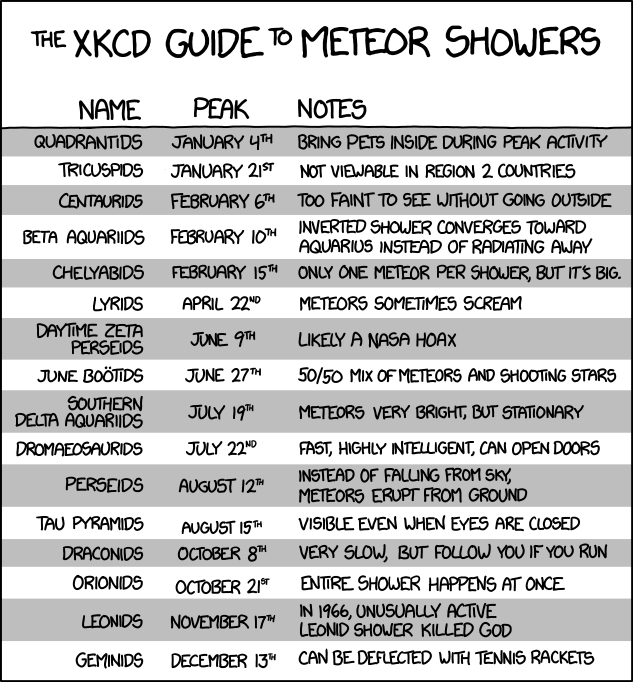 The Meteor Shower is small! Is there a clever reason that I'm missing for why Dromaeosaurids is out of sequence? Greyjoy wrote: Is there a clever reason that I'm missing for why Dromaeosaurids is out of sequence? The Dromaeosaurids are big (and do whatever they want)! Wow. Quite some time since we've seen a raptor joke. Can you edit in the alt-text, please? I was going to guess that June 12 was the release date of Jurassic Park, but IMDB lists it as June 11, 1993. Then I guessed that it was the upcoming release date for Jurassic Park IV, but no, that was supposed to be June 13, 2014 (before it got postponed). You can get stationary meteors - they're called 'point source meteors' and occur when the meteor is heading straight for you. The Beta Aquariids haven't been viewable for over 30 years now, having been out-marketed into obsolescence by the VHS Aquariids. geospacedman wrote: You can get stationary meteors - they're called 'point source meteors' and occur when the meteor is heading straight for you. That sounds both awesome and terrifying at the same time. Also I can't wait to see the Perseids in 3 days! What's the best place to view it? And how do I know I won't be killed by erupting meteors? Angua wrote: Can you edit in the alt-text, please? I think it's a paleontology joke referring to fossils being found "out of sequence" (i.e. buried in anachronistic rock strata). For example, if a hole develops in an older rock layer that is later filled with newer material including fossils, then you get what appears to be a fossil embedded in a rock that formed before the fossil itself existed (e.g. Cretaceous fossils in a Triassic rock layer). Young-Earth proponents often point to this jumbling of different-aged materials as evidence that stratiographic dating methods are faulty. Lost it at this one. Both accurate and hilarious. The best place to view it is beside friends. It may be overcast, take friends. The last time I watched a shower we were laying down watching. It was nice. I fell asleep. Where? 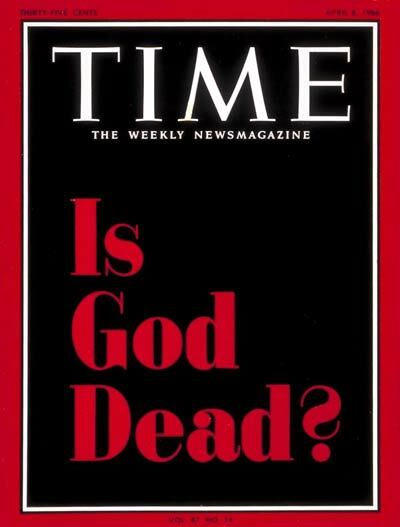 Is a good question. With astronomers is very good. Up high. If you can get up above the clouds. Not in a plane. It seems to me that it might be hard to relax and count shooting stars while flying. My favorite in The List: Only One; But it's Big! That is funny. Nope. They are all funny. So, funny. Humans are noisy. We watch the silent skies and scream about the shooting stars. Light pollution is sad. No species will be lost to light pollution. But; Some people have only One star. On a clear dark night, maybe a handful are visible. Some people have only seen the stars on a Screen. Stars are not a big deal. I have seen a dark sky lit by Stars stun people into silence. It can happen over and over again to the same people. Actually, some meteors do scream, or at least whistle, or whatever you call the sound made by a falling bomb. And you left out the Annelids. They often stop partway down to ask directions. I'm saddened that it's missing the Triffids. The only safe place to watch them from is a coma. Today's strip has (for me) the highest number of chuckles per pixel of any strip I've ever seen Randall do. I suspected there might be such a thing as inverted showers, but of course that's nonsense too. So the only sort-of serious part is the "Too faint to see without going outside", which is of course true for most astronomic phenomena. Well, unless you have a panoramic window in a remote countryside house and the lights off. So the Chelyabinsk reference was obvious. Are there any other puns hidden in the dates? Actually, I found reading the OTT-related jokes here much funnier than the comic. You left out "Would not watch again"
What do you mean out of sequence? They are in chronological order. Last time I checked July 22nd came after July 19th and before August 12th. Apparently, it was a different date that has since been corrected(?). You may have seen a meteor shower, but I bet you've never seen a shower "meatier" than this. Every time I've tried to see a meteor shower, I basically ended up seeing nothing. The only thing I hate about living in this part of the country is the atrocious amount of light pollution. And it is a many many hour drive to get away from it. bigchiefbc wrote: Every time I've tried to see a meteor shower, I basically ended up seeing nothing. The only thing I hate about living in this part of the country is the atrocious amount of light pollution. And it is a many many hour drive to get away from it. pkcommando wrote: Apparently, it was a different date that has since been corrected(?). Heresy. Even though Time has ended... GLR is not dead. Huh? There haven't even been Time 1966 yet... latest page is 1355. I was so happy when I found out that Tricuspids was on my birthday (January 21st!) but then immediately realized it was fake. Maybe they meant TimeFrame 1966. Not a question, but still, inquisitive. For those who didn't see it, or need a reminder: it said June instead of July.